Baybayin — the ancient writing system of the Philippines — could be making a comeback, if lawmakers have their way. The script is a step closer to becoming the official national writing system of the Philippines with the approval of the National Writing System Act (House Bill No. 1022) by the House Committee on Basic Education and Culture. The bill, which was authored by Congressman Leopoldo Bataoil, will be scheduled for plenary debates and then for approval on second and final reading. The measure seeks to declare Baybayin as the national writing system, in a bid to generate greater awareness of the ancient script and to foster wider appreciation of its historical significance and calligraphic elegance. “The importance of writing in general and of the alphabet in particular for the preservation and progress of civilisation is incalculable,” Rep. Bataoil said today (Monday, April 23). Under the bill, all local manufacturers of processed foods would be required to use Baybayin labelling alongside translations on all packaging. 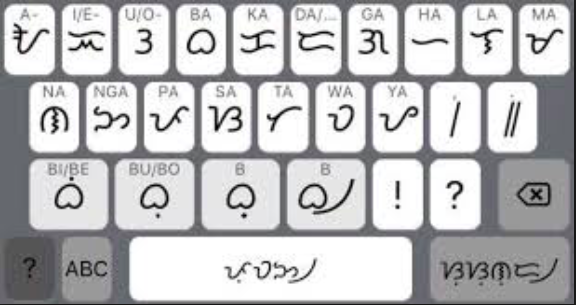 It will also make it compulsory for local governments to include Baybayin on street signs and all public facilities — including hospitals, fire and police stations, community centres and government halls. The bill would also require newspaper and magazine publishers to include a Baybayin translation of their name. Finally, the bill would also require government agencies to disseminate information on the script by giving out reading materials in public and private educational institutions and other agencies and offices. The bill has already received support from the Department of Education, the National Commission for Culture and the Arts (NCCA) and the advocacy group Baybayin, Buhayin. The NCCA will be tasked to protect, preserve and conserve the script as a National Cultural Treasure. The writing system is derived from the Brahmic scripts of India. Despite being supplanted by European Roman script after the arrival of the Spanish, its survival is thanks to careful documentation by Catholic Clergy during the colonial era. “Baybay” means “to spell, to write, to syllabise” in Tagalog. It will cost billions of pesos to implement the system in labels, signs, and in government offices. It will eventually cost more billions of pesos when tourism and foreign investment grind down due to confusing road signs, labels, bureaucracy, etc. It will eventually cost even more billions of pesos when children’s education will be bogged down with useless, archaic script. I know from experience that people in Manila speak better English than those in Davao City. Why? Because in Davao, kids learn Visayan, then Tagalog, and then English. In Manila, they only learn Tagalog and English. But Rep. Bataoil wants to add more burdens to school children. This is all about foolish pride. Sorry, folks, but the world gets by on English, Chinese, and a few other major languages. All of this effort to recover the past is foolish, because it will ruin the future. Philippine school kids should be taught English as their primary language. Parents can teach their kids other languages if they want. Then the Philippine economy would soar instead of sour.